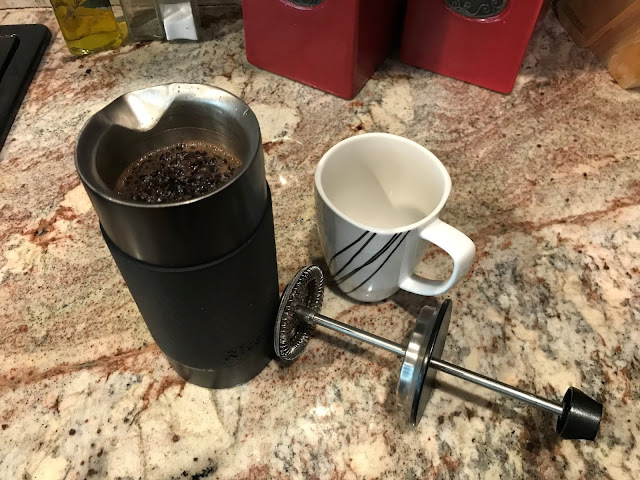 About a year ago, I backed a KickStarter campaign for the Rite Press, a nifty coffee french press. It solved my one really big complaint with pressed coffee: the cleanup. The press' carafe had a detachable bottom to make it easy to clean the coffee grounds out. A very simple and brilliant idea. The Rite Press had some other cool features too. It was made of vacuum-insulated stainless steel (like a Yeti tumbler) to retain the heat. And it came with a timer and a thermometer to perfect the brew. And they intended to make a half-liter version, which is perfect for making coffee for a single person. I loved the product concept. It seem perfect for making myself a good cup of coffee at the office. I really wanted one. So I gave them my money. It was my first Kickstarter. The expected shipping date was April of 2018. The project greatly exceeded funding goals and raised a lot of money on two different crowd-funding sites. Unfortunately, however, it went way over schedule due to some design and production issues. The company was also very slow and not very transparent in communicating about the delays. Around August, I still didn't have my press and I started to believe I'd lost my money. But then at the end of November I finally got mine. It is actually pretty nice. The thermometer and timer are totally gimmicky, but the press itself is exactly what I'd hoped and much easier to clean than a regular press. And the insulated carafe is awesome; it keeps the coffee hot for way longer than it takes me to drink it. So I was made whole. Well, apparently I was just lucky. Yesterday, I found out that the project, despite all the money raised, has burned through their funding capital. Most of the people who backed the project won't get their coffee presses unless they and others put yet more money into it. (You can imagine how that news is going over.) I feel really badly for those folks who, like me, loved the concept and listened to a lot of false promises but, unlike me, didn't get their presses. It's totally not cool. And I wouldn't be surprised to see a lawsuit in the near future. For the record, I don't think the Rite Press people set out with the intention of ripping people off. I think they had good intentions but badly mismanaged the project and the funds. In the end, whether from fraud or incompetence, the result is the same. So the lesson I'm taking from this: Crowd funding web sites provide an e-commerce type of experience that projects the illusion that you're ordering product. Even if you know better (I did), the experience still lulls you into thinking it's more of a "done deal" than it is (I did that too). But you're not buying product. You're making a bet in a race where 9 out of 10 horses fail to finish. So don't back a project because you actually expect to get the product; back it because you really buy into the vision and just want to help make it reality.